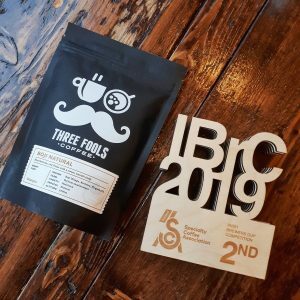 The 2019 Irish Brewers Cup took place in 3fe’s Roastery in Dublin on the 19th of January. We were eager to enter this year due to our successful debut year in the 2018 competition. Work started as soon as the competition opened for entry, we had to choose a bean, roast it perfectly, write a speech and nail down a recipe for our brew. We had a lot on our plate! Alex, one of our baristas, competed this year again. 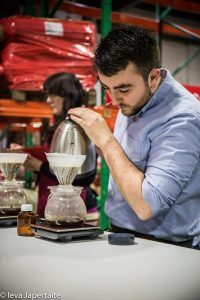 He was up against eleven other hugely knowledgeable and experienced coffee professionals from across the country. We think it’s best if we let Alex write this piece in his own words, he can probably explain it all better than most of us! Over to you Alex! You’re always lucky to find a great bean on a cupping table. There hasn’t been too many cuppings I’ve attended where I have found a competition level coffee, just out of the blue. In fact, this was probably the only one! 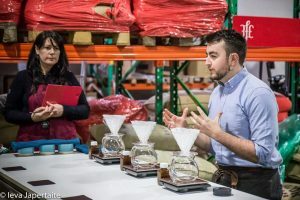 We found the Boji Natural when we sampled a few coffees from a green coffee importer in Belgium, who we connected with at the London Coffee Festival. The Boji was a stand out for all of the team in the shop. It was bright, fruity, floral, juicy and had a sweet body that lingered on. It was immense. Immediately, we ordered a bag of that coffee, as well as a few others. In the meantime, we kept looking for other competition coffee’s from importers across Europe. We sampled everything from Natural Geisha’s to Washed SL-28’s from Kenya, but none of these lived up to the Boji. About twenty days before the competition, we finally decided that we’ll definitely use the Boji, and we’re delighted we did! The coffee comes from the Boji Village Washing Station, about 25 kilometres from the town of Yirgacheffe. The washing station sits at 1800 metres above sea level, and accounts for around 1000 pickers in the region. The village has a stable temperature of 22-27 degrees Celsius and has high rainfall, which provides ideal conditions for growing beautiful coffees. Boji is famous for producing absolutely amazing coffees, be they washed or natural. This coffee is a naturally processed heirloom varietal, which explains the Strawberry like sweetness this coffee has. When working on the flavour descriptors for the competiton, we found notes of Caramel, Vanilla, Dried Fruit, Almond and Floral Notes in the Aroma, Strawberry like sweetness, and orange like acidity with a Sweet, Full Body which gets Juicier as it cools. In the aftertaste, we found notes of caramel, almond and vanilla. What you need: 20g of our Boji Natural, V60 Brewer, V60 Filters, 300ml of 94°C Water, a Caraffe or Jug, Weighing Scales and a Timer. Weigh Out 20g of the Boji, and grind it at a medium to coarse grind setting. Prewet your filter thoroughly with your brewing water (94°C or just off the boil). Add the coffee to the filter, and make sure the bed is flat. Use 300g of water in 5 stages, each pour is 60g. Start the timer and add the first 60g of water to “bloom” the coffee for 30 seconds. After the 30 seconds, pour another 60g. Once the water filters through, pour another 60g. Follow this step, 2 more times. 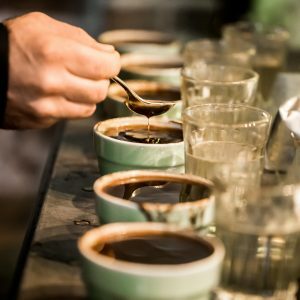 Once the final 60g is added, give the V60 a little wiggle, then tap it against the caraffe. This makes sure your coffee bed is flat, and that everything is brewing perfectly. This should take 3 Minutes and 3o Seconds to brew. I also made my own water for this competition, using the Barista Hustle recipe. I don’t suggest you do that at home, but I do suggest using a hard water – such as Tesco Ashbeck to brew with! For the presentation, I focused my attention on sustainability and pricing. You see, in 2018 the commercial Price of coffee dropped below $1USD per pound, which is outrageously low and not fair for farmers whose livelihood depends on the price they can sell their coffee for. If they aren’t making money, they will no longer produce coffee, and move to other crops. We’re already seeing this in Bolivia, where farmers are moving away from coffee to more profitable crops. So we focused the presentation on the sustainability of this coffee. Our green importers have been working with the Boji washing station for two years and have pledged to work with them for the foreseeable future. They pay the washing station a fair price, well above the average price of specialty coffee across the world. 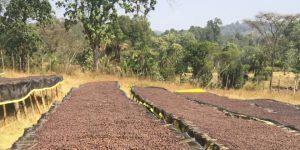 We love this coffee not just for it’s unique flavour, but because it also helps to support around 1000 pickers in a village! In the end, we finished in second place yet again. We were delighted to be in the top three! Well done to Stephen Houston of Bailies Coffee Roasters for taking the top prize, Michael Powell from Middletown Coffee Co for placing Third and everyone who competed on the day! You can grab a bag of the Boji Natural Right Here or in our shop on Grand Parade in Cork City!